My favorite part of being an entrepreneur is no longer having to worry about someone undervaluing my worth. If I have ideas that I want to try - I can implement those ideas immediately. What is the idea behind your STEM scholarship program? My daughter is a STEM student; she excels by leaps and bounds. During the time she has been a STEM student, we discovered there were minority girls and young women who excelled in STEM programs but didn't have the resources to get to the next level. Sometimes, we need a push upward. Our goal is to assist girls and young women who need someone to extend a hand and reach back to pull them up. That's where we step in and all we ask in return is for them to commit to themselves, not give up and most importantly, once they matriculate, they reach back and assist another girl or young woman. It started with my Granny - she was everything!!! She he taught me the benefits of being a woman. And one of the most wonderful things she taught me was how to take care of my skin, my body. "Being a lady is important - it's one of the things that make you, YOU! ", she says. She taught me how to mix natural products together to create lotions, soaps and butters with herbs and varying oils to resolve common everyday issues that off the shelf products couldn't correct. Years later I met a man, (who, not to long after became my husband) and he had eczema. I told him I have something you can use to cure your issue. He looked at me with a raised eyebrow and said what? I told him trust me, I'll take care of it! I whipped him a batch of butter with some specials oils that my Granny taught me to make and after a few uses, there were no traces of eczema, dry skin or cracking! He then in turn says, you should bottle this and sell it! Then it was my turn to raise an eyebrow! He pushed me and helped me to get it started, (thanks babe!!) and here we are today with Body Crystals Co.
How do you make all natural ingredients feasible for your products? We purchase only the highest quality ingredients for our products. We are our brand and it is imperative for us to stand behind our products and can only do that if we trust our sources. In one word characterize your life as an entrepreneur. Be scared, but keep going. The reward on the other side is immeasurable. Sleep!!! But what I know is that in order to get to where I want to go, I must get in position to birth the vision that's been given. That requires time to study, research, read and network. Without those things, I think it puts our team behind the eight ball. We noticed your KING campaign this year—can you tell us a bit about how you market to both men and women? Our marketing tactics are simple. We go to were they are - the barber shops, the hair salons, have Beauty and the Beard parties and they show up - they ask questions and they buy! When we run sales, we use men who look like our consumers and they buy. I find inspiration in my worship. 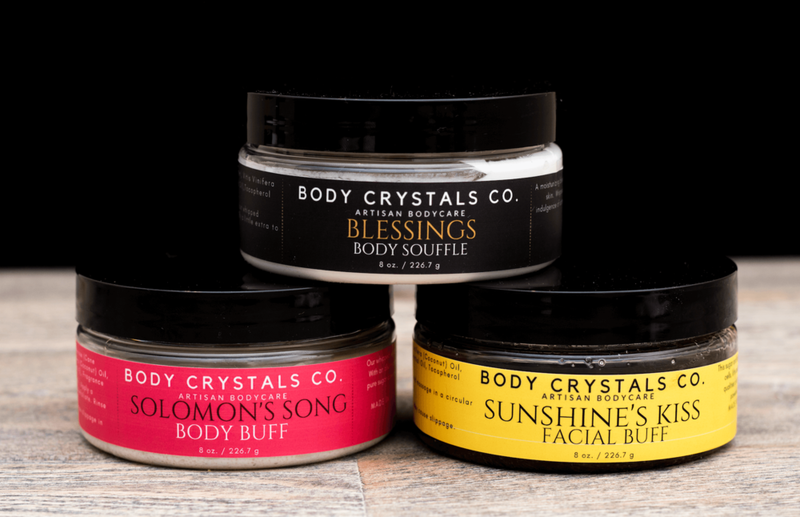 Body Crystals Co. is divinely inspired by God. 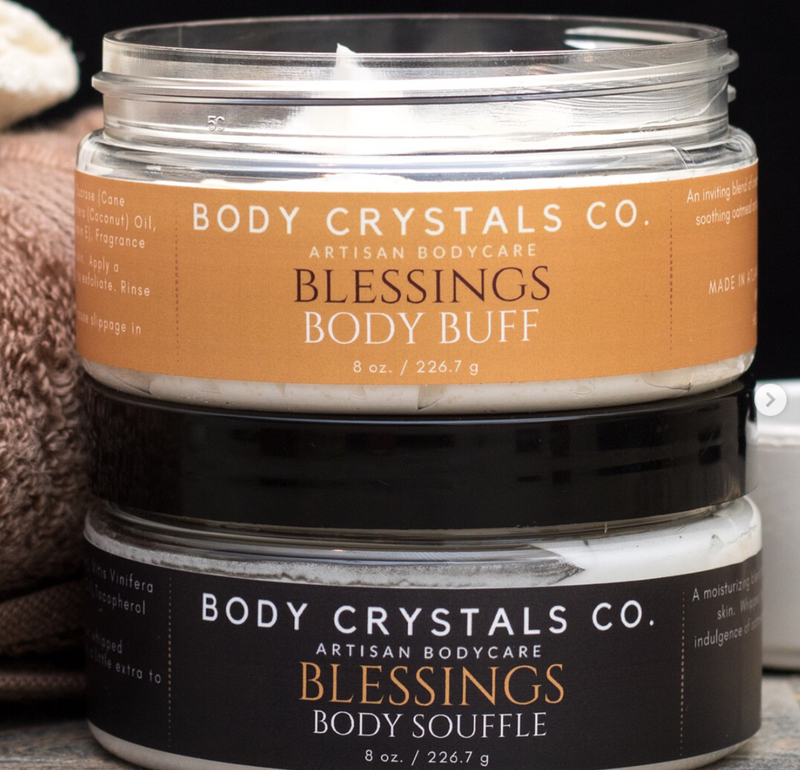 Our products are handmade with love and created in faith. I am merely the vessel He uses to produce what He gives me vision for. First, I pray for strength, then I encourage myself. I stand in the mirror and I say, "I was built for this"! If God himself creates and gives vision, then I will NOT be afraid to do what He's given. All His works are perfect. Being fearless is a non-negotiable. Give somebody a chance to change their life; everyone deserves an opportunity to be better than they are. Dawn Fitch, owner of Pooka Pure & Simple. I discovered her products about 10 years ago at an event in Atlanta, GA. They were absolutely amazing and made your skin feel like silk. When I dug a little deeper to find out who she was, I was excited for her. She's an overcomer and was determined to become victorious regardless of the path she chose. Her story inspires me to keep going, even when I don't feel like I can. She is riding her success train and I can't wait to see her next level! When did you know your purpose? About 15 years ago. I would consistently find myself in positions lending advice to others about how to reduce inflammation or peeling on their skin. I was the go-to for how do I brighten my skin? Or how do I keep my face from drying out after cleansing? With that in mind, my light bulb went off, in addition to my husband confirming that it's something I should do. He confirmed I had "it" and it was something the world needed to experience. My husband and I are former athletes and coaches. We believe the 3Ps apply regardless of skill set or industry -1. Persistence: if it doesn't work out the first time, keep pushing. 2. Perseverance: never give up and you will see the fruits of your labor, 3. Practice: apply what has been learned and you will see the fruits of your labor. If I said there was only one, I would be doing all of us a disservice. First, the Bible. It guides my life and my business endeavors. Secondly, the Go-Giver by Bob Burg. The Go-Giver simply says provide high stakes value and you will receive stellar results. It's as simple as reaping and sowing; what you put in is what you get out. In your opinion, what does it take to be a great boss? In order to be a great boss, you must be willing to listen, communicate and grow. Be open to others ideas and most of all be willing to have the crucial conversation - you'll be better for it in the long run. What lessons did you learn from your best & worst boss? From my best boss, 1. either you're in or you're out - there is no in between. 2. Mediocrity is not an acceptable. Strive to operate in excellence at all times. 3. Listen to your instincts, no one will ever know you better than YOU. 4. Like a good coach, regardless of the win or the loss, always say thank you; it will enhance the morale of your team and keep them excited about the next task so they will be encouraged to want do it all over again because their efforts were recognized. From my worst boss, I learned 1. Don't to be too emotional. 2. Consider the source when information is given. 3. Don't jump to conclusions. I love an amazing concert/show/performance and excellent food!